Looking for a dish that is a good source of fiber and calcium? Then we have the perfect dish for you. 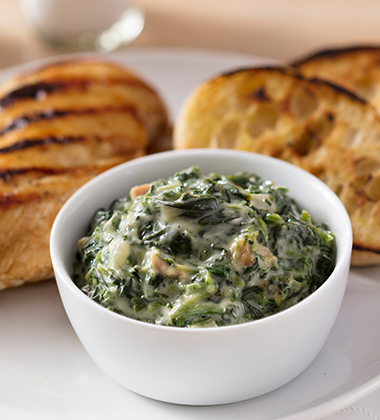 Try our delicious cream spinach made with Campbell's® Healthy Request® Cream of Chicken Soup, onions, garlic powder and nutmeg! kosher salt	 1 1/2 tsp. 1. In a large sauce pot, heat canola oil. Sauté onions over medium heat until caramelized, about 10 minutes. 2. Add garlic powder and nutmeg. Cook for another 2 minutes. 3. 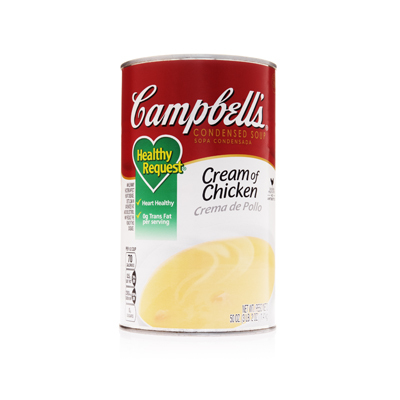 Add milk, Campbells® Healthy Request® Cream of Chicken Soup, salt and pepper. Simmer for 15 minutes. 4. Add spinach, continuously stirring. Reduce heat to low. Continue to cook for 15-20 minutes. 5. To Serve: Using a #8 scoop, portion ½ cup onto plate. Serve immediately.